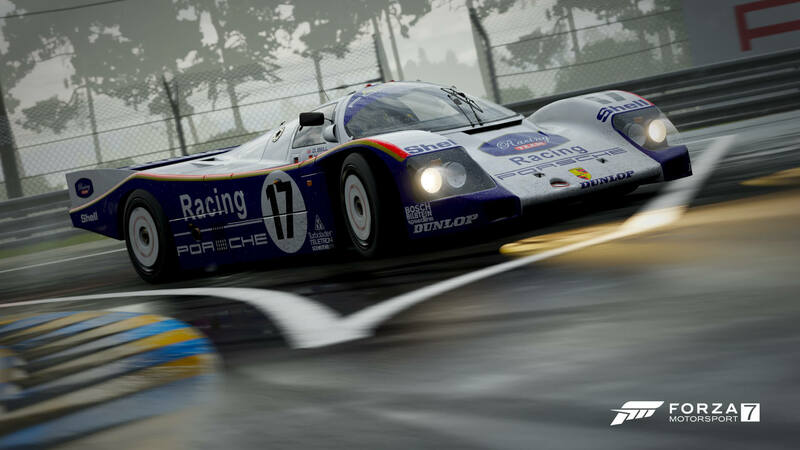 The Forza Motorsport 7 December Update arrives on Tuesday, December 4th, developer Turn 10 Studios has announced. 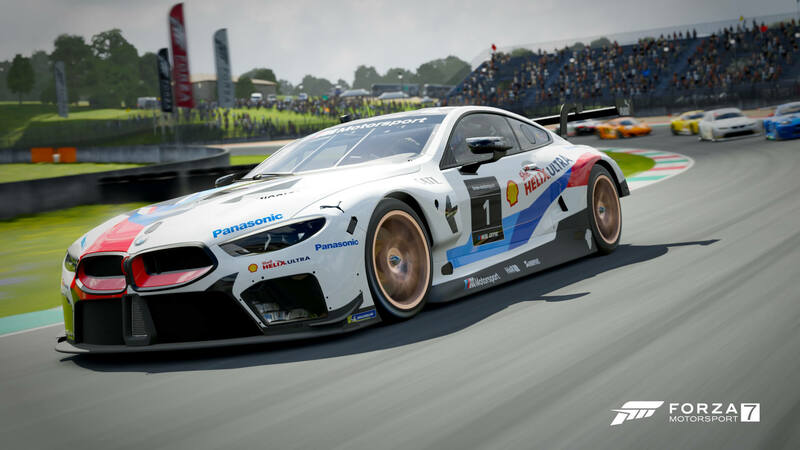 This update is headlined by the introduction of an all-new race car – the 2018 #1 BMW M Motorsport M8 GTE, which is being added to Forza Motorsport 7 as this month’s free Spotlight car. In addition, there’s also a much-improved force-feedback system for wheel users to enjoy, a new dynamic opponent labels system, and more – including the first step in a redesign of the Forza Motorsport 7 menu interface. Before we get to all that, however – let’s have a look at the star of the show. 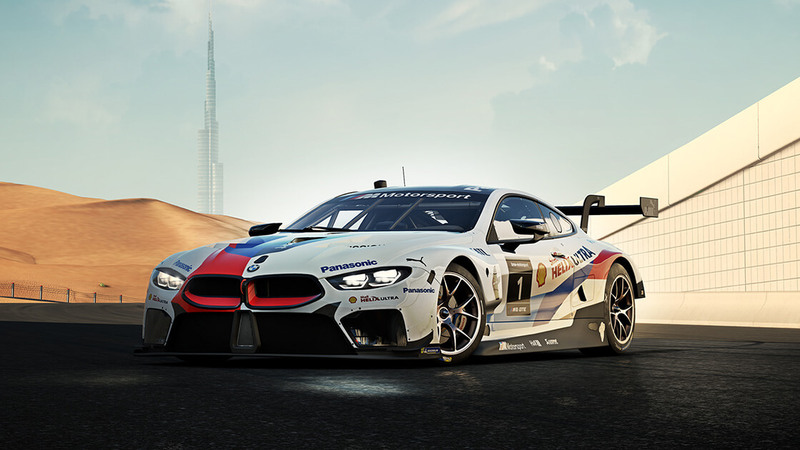 The all-new 2018 #1 BMW M Motorsport M8 GTE, which will be available for Forza Motorsport 7 players to add to their in-game garage beginning on Tuesday, December 4th at no additional cost. You can find out more about the car below, courtesy of the official description provided by Turn 10 Studios. After a seven-year hiatus, BMW has returned to the 24 Hours of Le Mans. Adding fanfare is the fact that the M8 GTE raced in both the FIA WEC endurance series and the IMSA series before the production model became available for sale. Call it reverse engineering of the best kind since this M8 GTE is the first BMW manufactured from the ground up as an LM GTE homologated car, instead of being built from an existing platform. Significant weight savings, obvious safety equipment, and extensive aero make this a custom-built racecar. What a production M8 will look like we don’t yet know. We do know is that the M8 GTE was able to keep pace at the Circuit de la Sarthe and in IMSA, BMW teams garnered two wins and finished fourth in the highly competitive GTLM class, proving it as a viable racing platform. Best of all, now you can find out for yourself how it performs. 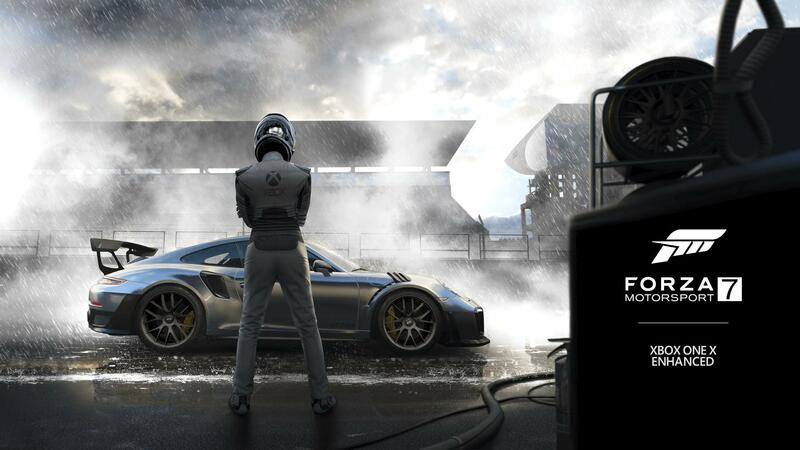 After installing the December Update for Forza Motorsport 7, the first thing you’ll be greeted to is an all-new splash screen, as well as a redesigned menu interface. The old slightly angled menu has been replaced by a new flat layout. The car and driver has been shifted over to the right-hand side of the screen, whilst the black and white image backgrounds for menu tiles have been replaced with new coloured images. In addition, the tile highlight colour has been changed from red to blue, whilst the opacity of tiles that don’t feature artwork has been updated to make them feel more alive. Turn 10 has also improved the transition times for certain menu items. 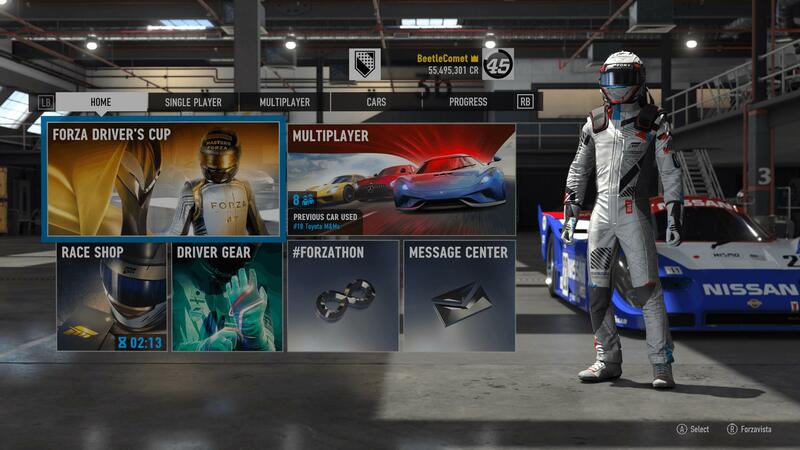 For example, it takes less time to get into the Forza Driver’s Cup when selecting that tile from the main menu. The menu interface isn’t the only aspect of Forza Motorsport 7 receiving a visual overhaul in December. This update also introduces “a new opponent label system” into the game. These labels are the information panels displayed above drivers in multiplayer lobbies, which show their Gamertag, Driver Level and Badge. The new label system offers a uniform, flattened look. These labels will also be “dynamic,” which means they will shift between three unique “states” depending on an opponent’s proximity to the player. 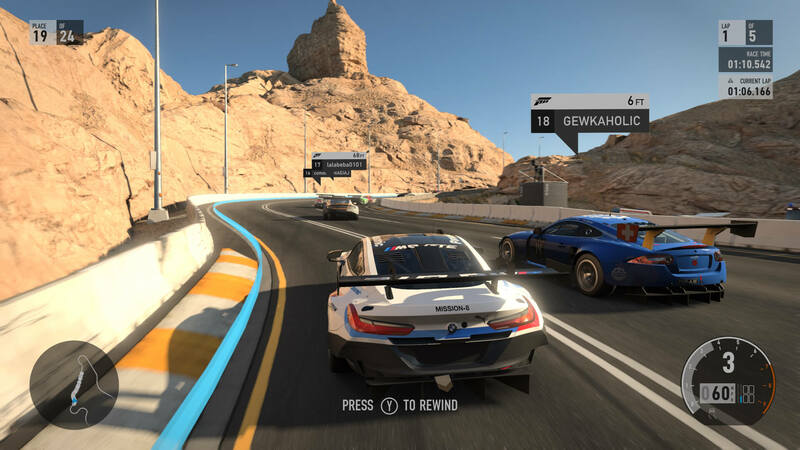 The closest “full” state will show a player’s Gamertag, their position in the race, and some event-relevant information such as their distance ahead – or behind when looking backwards, their total drift score in drift events, or their “It” status when playing Tag events. At medium distance, opponent labels will be shown in what Turn 10 calls a “condensed state,” with just a player’s Gamertag and their position shown. The furthest distance will see “far” state labels appear above cars, which will just show the player’s position in a race. Turn 10 has also made some design adjustments to the in-race HUD information items with the December Update. One example noted includes the lap time HUD elements, which have been made more uniform. In addition, the lap counter has moved to the upper right corner of the screen. The overall design of the HUD has also been given a more flat, refined look to it. The December Update for Forza Motorsport 7 also introduces an updated force-feedback model for wheel users. 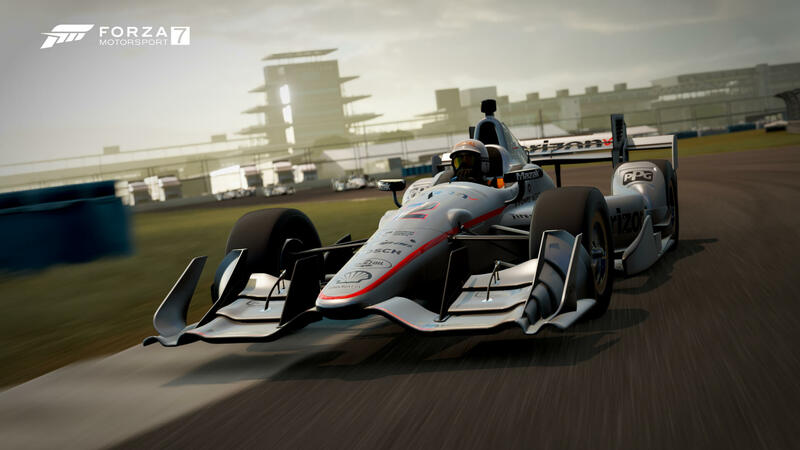 This new system has been described by Turn 10 as “a full physically based system utilizing Forza Motorsport 7’s suspension kinematics and tire modelling to send tire loads to the steering wheel.” The result of this is to produce a more intuitive feel with more accurate align torque and a solid feeling of connection to the road. It’s important to note that this new wheel update completely replaces the old system, which means tuning values set by players from before the December Update will be reset. Wheel users will be required to retune their wheels from scratch to take advantage of the new and improved system. All the details you need on retuning your wheel for the new force-feedback system can be found on the newly-updated Forza Motorsport 7 Wheel Guide on the Forza Support website. Otherwise, for a deeper look at the updated force-feedback model, be sure to check out our dedicated story discussing the motorsport fundamentals being updated and improved by Turn 10 Studios for the future of Forza Motorsport 7. Turn 10 Studios are also introducing some smaller improvements with its December Update for Forza Motorsport 7. The first of these makes the Rivals experience even better. Now when you’re hot-lapping and you’ve beaten a Rival, you’ll automatically receive a new Ghost car to challenge. As for the Specialty Dealer, it now displayers the original Collector Score of cars alongside the bonus Collector Score. 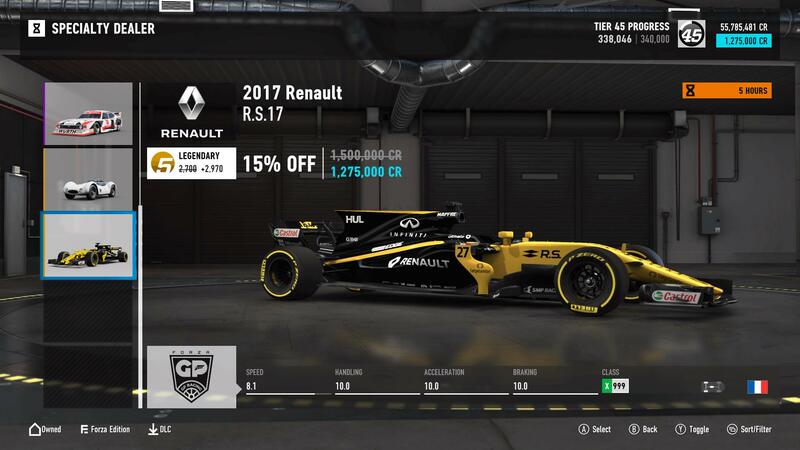 Furthermore, both the original price and sale price of the car are now also shown, as well as the discount percentage. Leagues: The latest season of Forza Racing Leagues has begun in Forza Motorsport 7. Enjoy four weekly series of intense action, featuring IndyCar race machines, Vintage Sport Coupe cars, and more. Up for grabs this month is the 1988 Lamborghini Countach LP5000 QV, the 1939 Maserati 8CTF, as well as the Mime and Karateka Driver Gear suits. Forzathon: Celebrate the festive holiday season with the arrival of several new Forzathon events throughout the month of December. Whether you’re racking up Drift points or aiming to win races, there’s a little something here for everyone. The ‘Holiday Races’ monthly Forzathon event will see you bank a cool 300,000 Credits for simply completing 10 races, whilst the 2014 BAC Mono, the 1957 Ferrari 250 California, and the holiday-themed Gingerbread Man Driver Gear suit are all coming under the Forzathon Christmas tree this month. Don’t miss out! Rivals & Hoppers: This month’s Spotlight Rivals event puts the all-new 2018 #1 BMW M Motorsport M8 GTE front and centre on the Nürburgring GP circuit – the perfect place to test the sheer power and performance of this modern endurance race car. 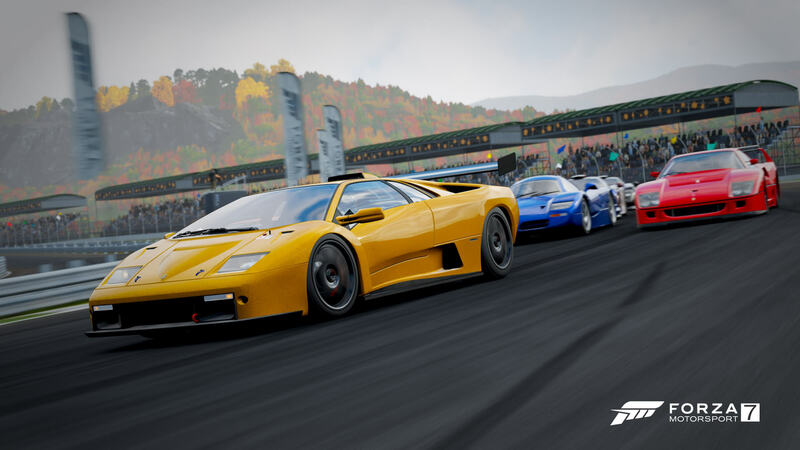 Elsewhere, there’s events starring the 1985 Ford RS200 Evolution on Laguna Seca, as well as an event in the rain at Silverstone starring the 2005 Hot Wheels Ford Mustang. This has been an impressive year of updates and improvements to the core Forza Motorsport 7 experience but Turn 10 Studios is far from done. 2019 will see the introduction of even more improvements and features to Forza Motorsport 7 based on fan-feedback. 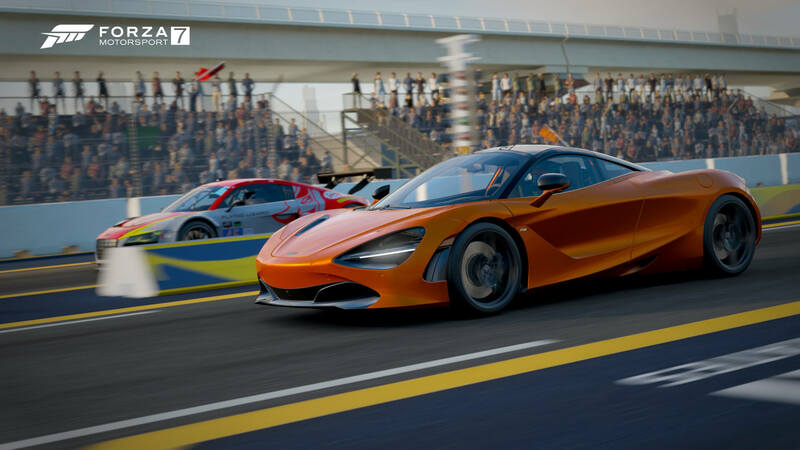 That includes the eagerly-awaited Forza Race Regulations adjudication system, as well as a rebuilt Drivatar AI system to deliver closer, more competitive single-player racing. For a detailed look at the Forza Race Regulations system, as well as some other new features and improvements coming to Forza Motorsport 7 in 2019, be sure to not miss this month’s edition of the Forza Monthly broadcast show. It’ll be live on December 13th at 10am Pacific (1pm EST, 6pm BST) on the official Forza Mixer and Twitch channels. Be sure to download the Forza Motorsport 7 December Update for Xbox One and Windows 10 PC beginning on Tuesday, December 4th at 10am Pacific (1pm EST, 6pm BST) to experience the most comprehensive and visually-pleasing version of Turn 10’s latest sim-focused racing game to-date. Plus, stay tuned for our coverage from Forza Monthly later this month for all the latest on the newest features and improvements coming to Forza Motorsport 7 in 2019.